Strong shockproof ABS case Soft-grip rubberised cover Belt hook Carry strap Easy to ..
Fisco Tri-Lok Measuring Tape Tough ABS case with non-slip rubber grip pad Easy-to-use brake h.. Tape for easy measuring and tape recoiling Winding handle Imperial and Metric .. Tape for easy measuring and tape recoiling Winding handle Imperial and Metric 50m Open Fram.. Tape for easy measuring and tape recoiling Winding handle Imperial and Metric 100m Open Fra..
6X High Speed Gear Mechanism: turn the handle one cycle and the tape rewinds six cycles Heavy dut.. 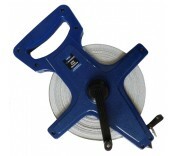 The Fisco Ranger tape is a heavy-duty, open frame surveyors tape with a spade handle grip, which ..